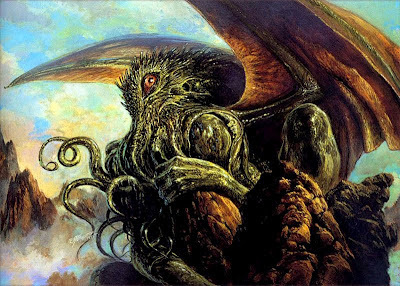 The esteemed and inestimable Robert M. Price, editor, has announced the contents of two new Cthulhu-mythos anthologies that feature tales by ye old dude. Both are scheduled to be released later this year. Also, the April issue of Lovecraft eZine will feature my story, "Ecstasy of the Gold." Official announcement here. Time for another celebratory gathering of monster movie geeks at Damned Rodan's Kaiju Kastle. This morning, con man extraordinaire Bill Mann and mad artist M. Wayne Miller descended into the pit of chaos to kick off the day-long fest. 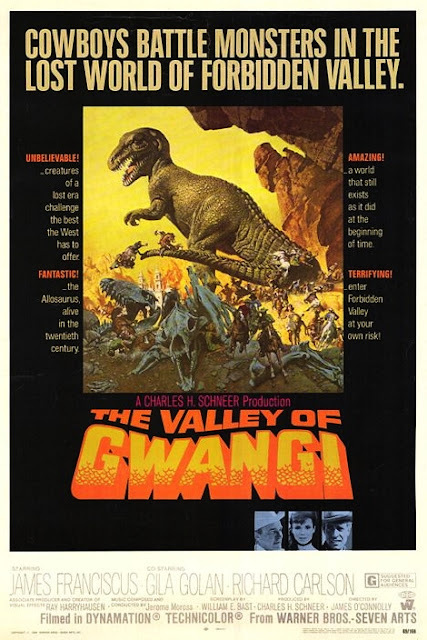 First up, the Ray Harryhausen dinosaur monsterpiece, The Valley of Gwangi, which I hadn't seen since I had considerably more hair up top. The traditional lunch at Ham's at Lakeside followed, where significant geekery unfolded, much to the horror of innocent passersby. Then, back home, up came The Host, the 2006 Korean oddity that features the most grotesque oversize carnivorous fish with legs you probably ever saw. I had viewed it at the theater on its initial run, and it left me somewhat nonplussed. Knowing what to expect this time, I enjoyed it a bit more, particularly the exceptionally well-done monster scenes. Finally, just to make sure Godzilla wasn't overlooked, we ran Monster Zero (a.k.a. Invasion of the Astro-Monster), and it was bloody proper, it was. After all this, Brugger came round, bringing with her a massive rain and hail storm, which came perilously close to flooding my living room. 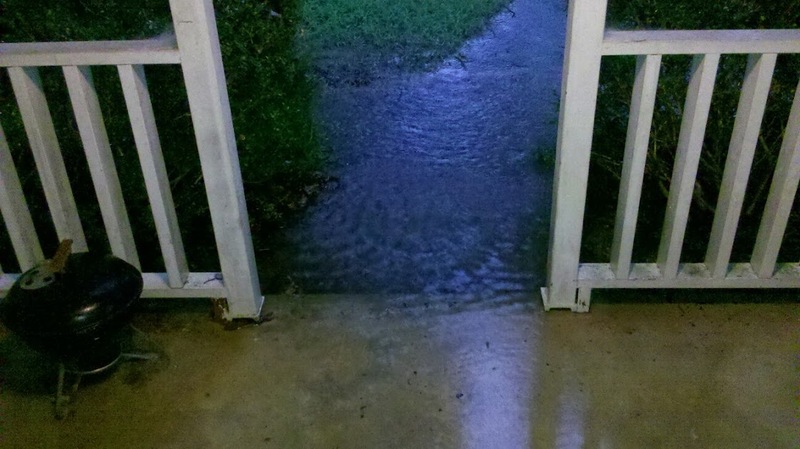 Fortunately, the water stopped just shy of entering, though when it receded, it left me a moat filled with alligators. Made it rather difficult for us to get to dinner, at Taste of Thai—easily one of the best Thai establishments in the area. 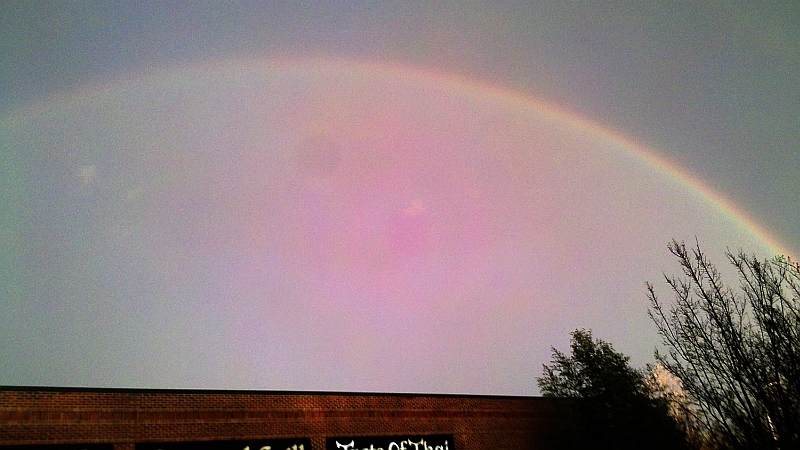 A purty rainbow greeted us as we arrived at the restaurant, but by the time we came out, it was raining all over again. At least...so far...we have avoided the tornadoes. A few episodes of Dexter rounded out the evening. I do hope that when I wake up in the morning I don't look out the window and discover that my house has drifted out to Cape Fear or someplace. Dammit. I left my sandbags in my other pants pocket. What is that behind ol' Rodan? Contraption? Thingamabob? Doohickey? You decide. 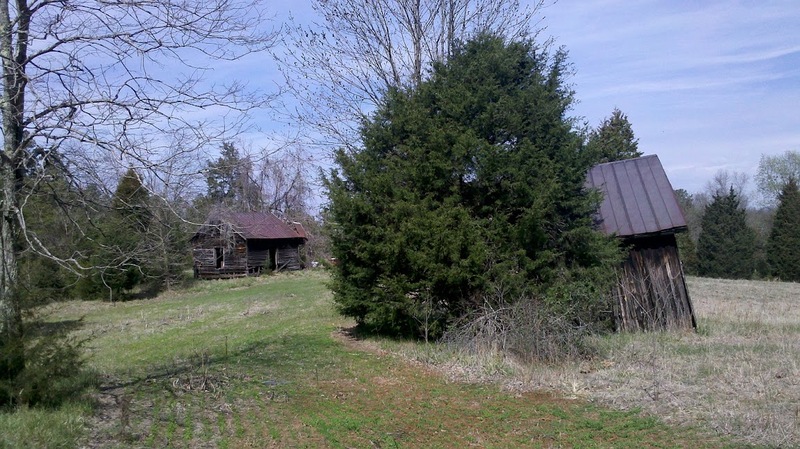 Spent yesterday caching the back and not-so-back roads of Caswell County, NC, and Pittsylvania County, VA, with Tom "Night-hawk" Kidd, Michelle "AkitaResQ" Wild, and Bridget "Suntigres" Langley. We decided we needed a team name for signing the cache logs, so we pooled our respective geocaching handles (including "D" for "Damned Rodan") to come up with Team NADS. Night-hawk had already claimed some of the caches we found, so on those, the remaining three of us signed as Team SAD. Apt, wot? For the better part of the day, we scoured Angler's Park in Danville for a couple of exceptionally well-done series of caches, "Cosmic Chaos" (GC3C644) and "Free Signal" (GC3C647). These required hiking several miles of terrain described by my friend Ed Kuykendall as "a miniature version of West Virginia," which pretty much says it all. The cache hider—a mysterious and certainly twisted genius known only as "All of Dem"—created some unique and challenging hide methods, particularly for "Cosmic Chaos." Given that we had mid-summer heat in mid-March, I'm pretty sure I sweated off at least some of the tonnage I gained over the winter. We finished up with an enjoyable bunch of little park-and-grab hides called "GeoNutz," hidden by one of the most twisted geniuses of all, the nefarious "Klaussinator." No green beer for me on St. Patty's Day, but the olives in my post-caching martini were green. That counts, right? Half of Team NADS...or two-thirds of Team SAD. Did I hear a chainsaw? I think I glimpsed Leatherface as we were exiting ground zero. 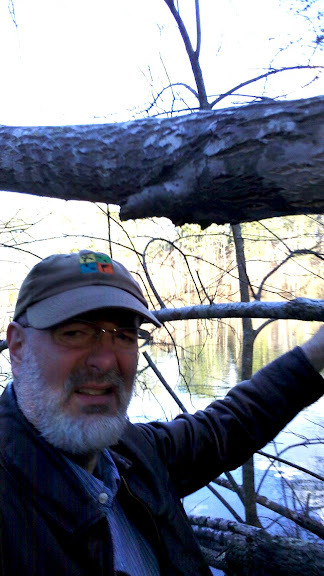 AkitaResQ, risking a smushing beneath a precarious old tobacco barn. Ever since my first glimpses of Tim Burton's take on Dark Shadows, I must confess I have been anything but hopeful. Having been so steeped in the franchise since my youngest days, both as a fan and an active contributor—via the HarperCollins novel series and the Big Finish audio dramas—to me, it is an intensely personal thing; a fictional world that I embraced long ago and have held in more than high esteem ever since. While I am firmly of the view that there is nothing beyond lampooning, I am, to say the least, disheartened to see what Burton is doing to Dark Shadows. Now, the movie may end up being a hoot, à la The Brady Bunch movies (which, in spirit, it appears to most closely resemble). More likely, I fear, it will only spoil the franchise's integrity for those whose introduction to it is this thing. After Burton's take on the story—which will no doubt reach masses of viewers that make Dan Curtis's original audience pale—will a newcomer be able to visit the original series, enjoy the worthy 1991 revival show, read the novels, listen to the wonderful audio dramas, and feel the intensity of the world the Curtis and his associates labored long and hard for so many years to create and perpetuate? I have my doubts. Whether Burton's Dark Shadows is a successful movie (who knows, I may even enjoy it as a parody), this trailer suggests...very strongly...that that Burton holds little or no respect for the creators and the series' longtime diehard fans. It's all about the lowest common denominator. Trailers can be deceptive. So, we shall just see. He said...without enthusiasm. A quick note to Mr. Burton: Barry White's "You're the First, My Last, My Everything" was from 1974, not 1972. Old Rodan at "Sinclair" (GC38X18). It's a veritable antique sign museum. What a beautiful day out there, and I mean what a day. 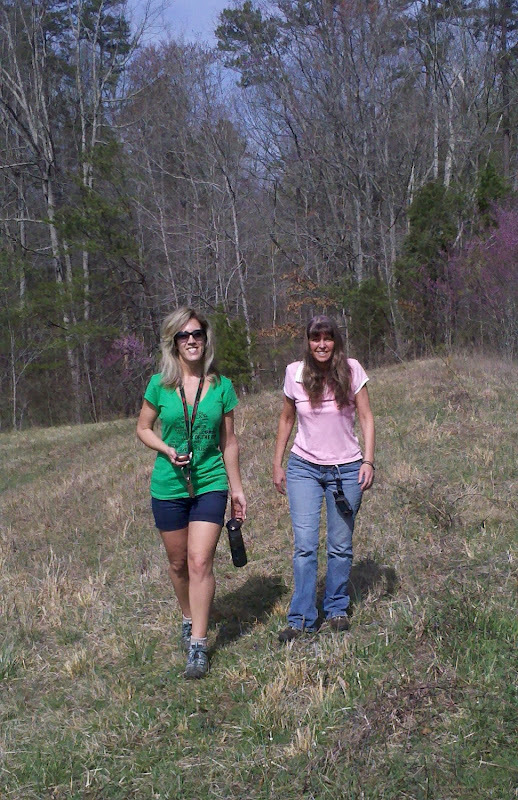 A cache run through Asheboro/ Randolph County with Bridget "Suntigres" Langley. Lots of variety—everything from park & grab micros to superdynawhopping ammo cans to extreme terrain hides. My favorite had me ascending into the lofty heights of a big bamboo grove. Whoa! What a view! One cache (GC38X18) took us to an interesting setting out on the country: a little service station that has been converted into something of an antique sign museum. 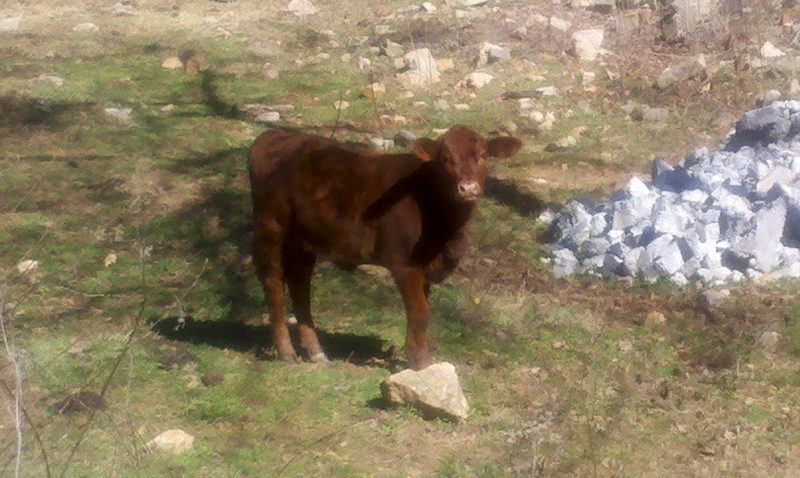 At one cache site, a mopey moo cow came to see what I was up to. Sadly, moo cow could not go out caching. ...and ended up here. Funny how that happens. She's hoping to make Scotland. Moo cow mopes because it can't go caching on such a nice day. 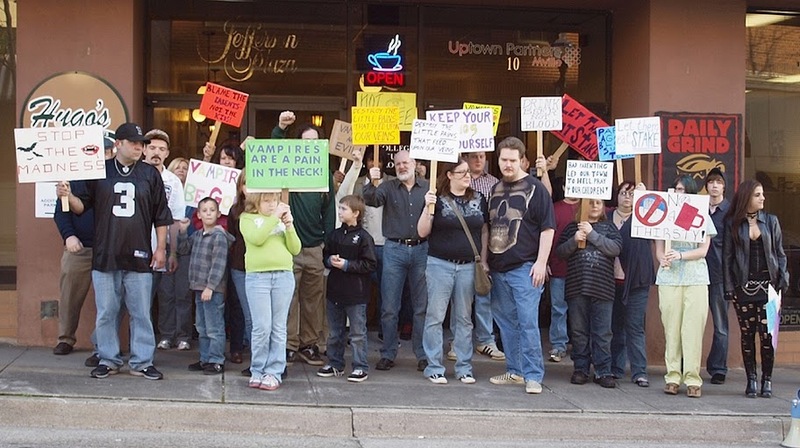 An unruly mob on location for Young Blood, the movie, in Martinsville, VA.
Be a bud. Don't drink blood. Young Blood is the story of a small town whose children are succumbing to a veritable plague of vampires. And the parents don't like it. Not one little bit. Here's how it goes: "Most little girls play with dolls and have tea parties, but Anavey and her younger sister, Anastasia, would rather play with severed body parts and drink blood. These angelic girls seek to create an army of young, blood-sucking vampires, out to destroy the adults who control their lives and treat them unfairly." Young Blood, from the fertile imaginations of Martinsville, VA, natives Mat and Myron Smith, is being filmed on location in my old hometown. Mat is the proprietor of Smithstonia Videography and Graphic Design—and has also created his own line of rocking home-made hot sauces (which I have tried and highly recommend). The movie's leading roles are played by Autumn Ward, Zoe Cox, Rebecca Kidd, and Myron Smith. Today, a large number of extras was needed for an unruly mob scene in uptown Martinsville, so I decided to knock off work a little early and book up from Greensboro to participate. At 5:00 PM this afternoon, around 50 folks showed up at The Daily Grind in Jefferson Plaza to assume the roles of anguished townspeople who just don't quite know how to deal with the sudden, ugly change in their children. But what could be more American than to parade through the streets protesting? Thus, carrying signs and chanting "Destroy the little pains who feed upon our veins!" and "Be a bud! Don't drink blood!" we marched up and down Church Street, baffling the local populace and frightening at least one stray cat. Tensions mounted as the affronted owner of The Daily Grind decided not to let the mob use the establishment's restroom, since it was for customers, not pitchfork-wielding rabble. The coup de grâce came when, at the end of the scene, a pair of police officers armed with doughnuts arrived to break up the gathering and make some arrests. Doughnuts and pitchforks went flying in every direction. Several protestors—nonviolent, I might add, since they were just shy of shedding blood—were hauled away like so many rabid dogs. As emotions among the crowd reached a crescendo, Mat yelled "Cut!" 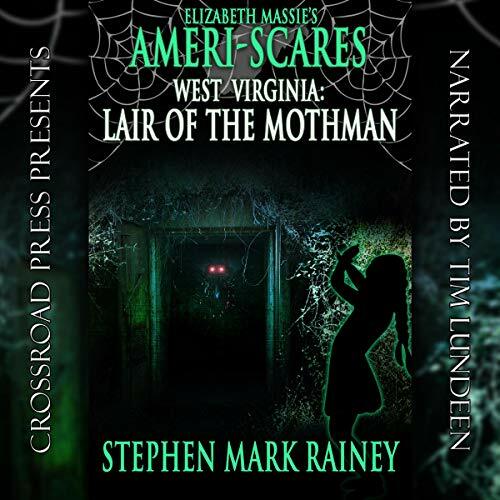 Whether it makes it into the final edit, who can say, but in answer to a reporter's question about the plague of juvenile bloodsuckers, I did get to utter a few lines about children in general being wired badly. It was a pleasure to participate in this little endeavor, not to mention make the acquaintance of several very nice local folks. I look forward to seeing the final cut of Young Blood, and when it's released, you can be sure you'll read about it here. Visit www.youngbloodmovie.com or www.facebook.com/YoungBloodMovie for more info on the movie. 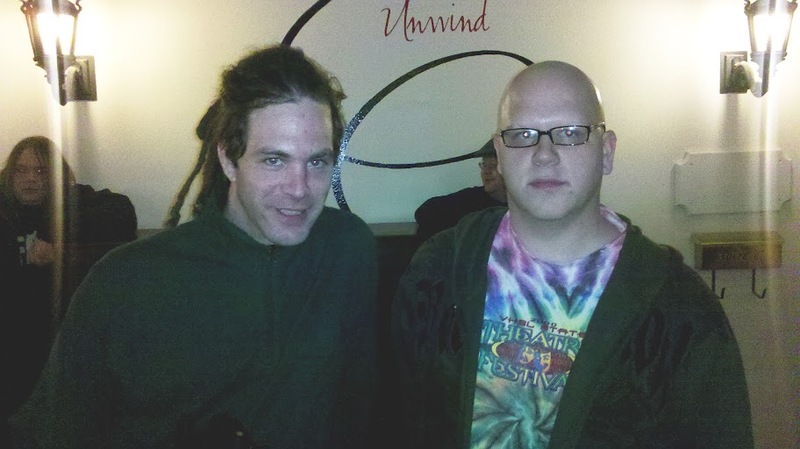 Mat and Myron Smith, the duo behind Young Blood. 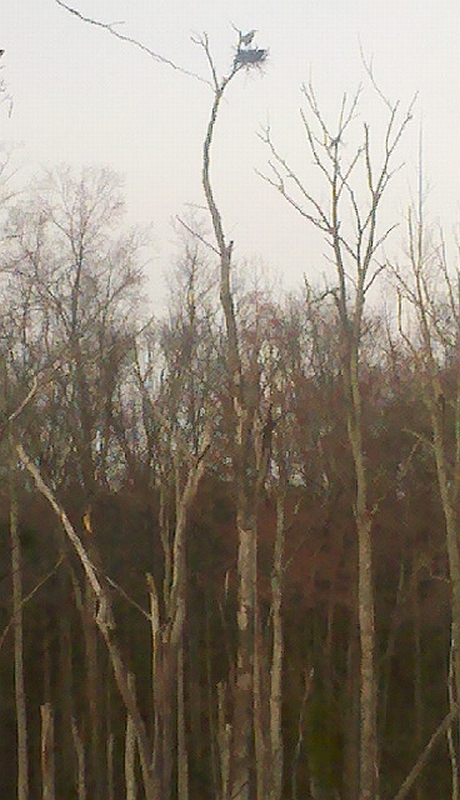 It's not quite Boggy Creek, but Bigfoot has his own library back here. Almost a year ago, I discovered what I call the Bigfoot Trail, just a few miles up the road, near Lake Townsend (The Great Blue Heron Nursery, Bigfoot's Library). There's a fairly new cache on the trail, so after work this afternoon, I hiked out there to claim it. A good couple of miles out and back, and apparently a new mountain biking trail is in the works out there. I have mixed feelings about it; it's a beautiful area, and really quite suited to a new trail. I'm generally glad to see new trails going in around the Greensboro watershed properties, especially since they're all so well-used. 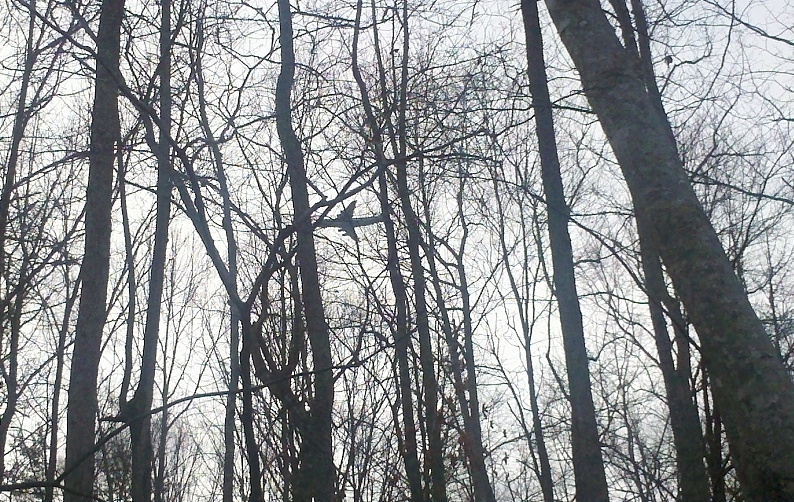 But since I started hiking out there, the Bigfoot Trail has been isolated and almost eerie. Its most notable feature—apart from being home to the Bigfeet I've yet to actually see—is a spectacular Great Blue Heron rookery. I doubt the birds will be overly disturbed by trail bikers, but the serene, nearly primal atmosphere will surely change. 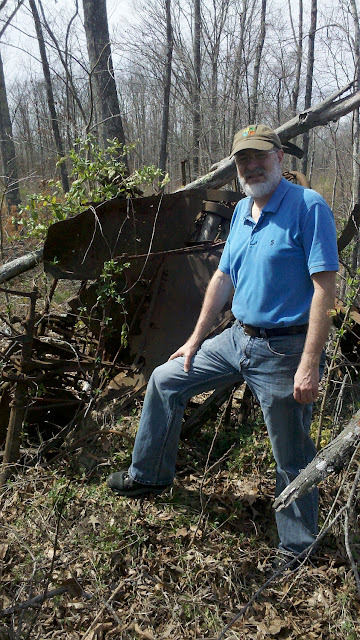 While I can't lay any claim on the land, I feel a personal connection to it, a sense of being one of a relative few who have ventured into that locale in the recent past. It's the somewhat disheartening sense of having to share a "secret" place with a much larger number of people. Fortunately, the watershed trails generally are well-kept, with scarcely any human refuse left out along them. 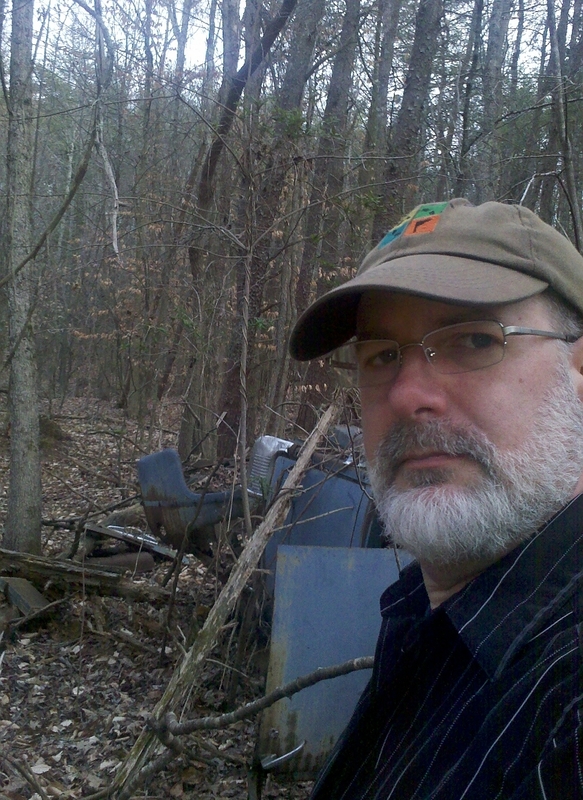 And when trash accumulates, the local geocachers get together and clean it all up. 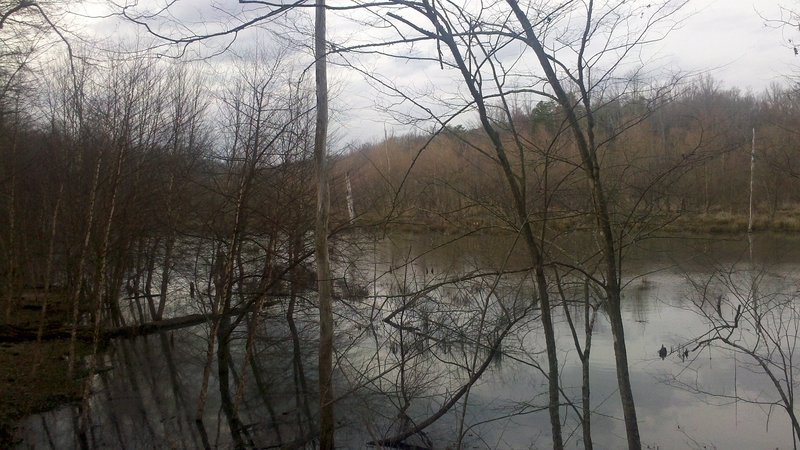 I do love the Greensboro trails. Today, overt signs of human activity out there were few, but somewhat dramatic. For some time now, heavy military transport jets have been coming and going regularly from Piedmont Triad International airport, and this afternoon, a half dozen or more C-5 Galaxy transports passed low over the trail in the course of an hour. Majestic things...massive...seemingly hanging almost motionless in the sky as they approach. 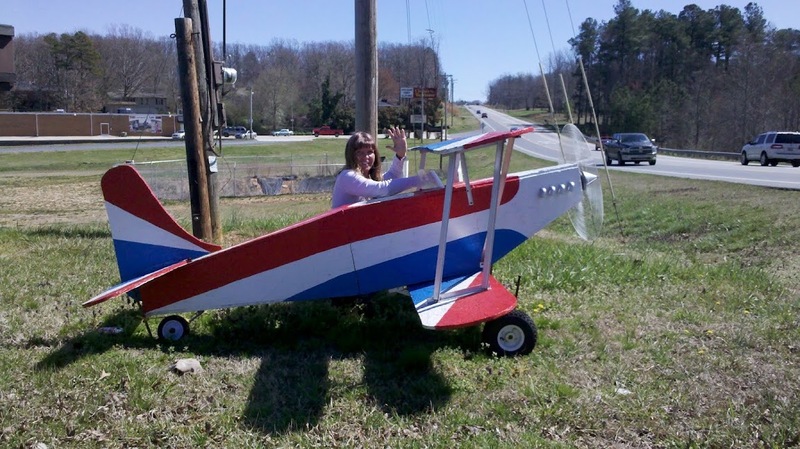 From several points along the trail, my view of them was unimpeded, and being a long-time aviation enthusiast, I really enjoyed the spectacle. Judging from the very fresh footprints, horseback riders were out there today. There's a new parking lot—as yet unopened—for the trail, which made for a rather disconcerting sight. But it appears that Bigfeet can't be bothered to use it because, way back there in the woods, I found the Bigfoot Mobile. 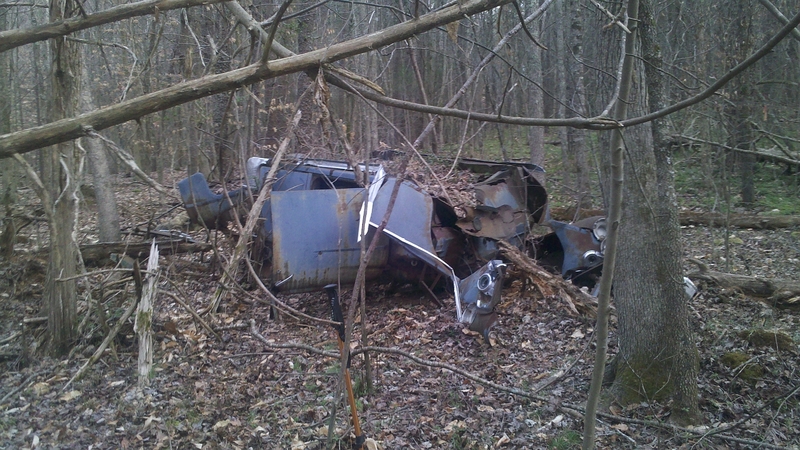 Looks like a 1940s-vintage automobile, all in pieces, so ancient that the woods have completely enveloped it. Clearly, Bigfoot can't drive. Today's hike was an enjoyable, if somewhat wistful return to a place I'm very fond of. Whatever the "official" name of the biking trail turns out to be, to me, it will always be The Bigfoot Trail. A C-5 Galaxy on its approach to PTI. The sound shook the ground around me. Obviously, Bigfoot got his driver's license from a Crackerjack box. I had nothing to do with the wreckage...this time. Great Blue Heron just looks down and laughs. Back from Stellarcon weekend in High Point, and this year, much more than others in relatively recent memory, it was quite a good one. I headed over on Friday evening—doing a little caching along the way, of course—and went right into the first of several panels. It was a fun one about bad movie monsters, a topic so rife with material that the panel could have gone far longer than its one-hour limit. I headed out for a late dinner at Thai Chiang Mai, which was, as usual, quite decent, though very, very slow to arrive...no doubt due to a wall-to-wall crowd (which seemed to be the norm all over High Point this weekend; to my knowledge, there was no major event happening in town, but I was beginning to fear that High Point might fall through the earth's crust). Then back to the con to participate in the "Horror Through the Ages" panel, which proved to be a lively discussion about things that have scared people since the dawn of man. It might have been subtitled "Arachnophobia." Once done, I made my way through a dense and wonderfully eerie fog to a few more caches and then home. Saturday, I grabbed Brugger and returned to the con for my reading ("The Jack-o'-Lantern Memoirs"), which had a very attentive audience. Not large, but attentive. Out for a most welcome lunch at Tex & Shirley's, where I allowed the server to talk me into trying their Manhattan pancakes...which proved to be fantastic. Then a few more caches, the most interesting of which we found at a scenic graveyard that had its own little playground to entertain the wee young undead. 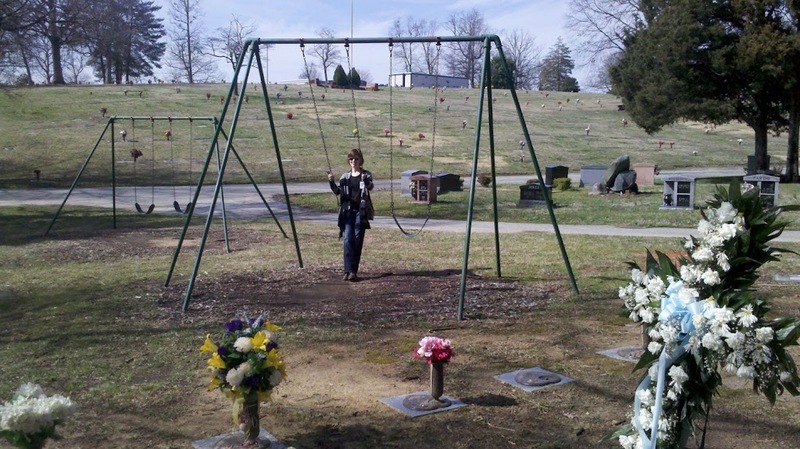 (Notice in the photo above that Brugger has displaced the unfortunate undead to take her turn on the swings.) A couple of drinks at the very pleasant Uptowne Tavern on Main Street (we didn't even make fun of the pretentious "e"), and then back to the con for the well-attended and energetic panel, "Writing as Therapy." A special shout out to writers Andi Newton, Chad Bowser, and Janine K. Spendlove, whom I had never met before and really enjoyed making their acquaintance. Another Asian dinner seemed quite appropriate, since High Point has a large number of Asian restaurants, so we chose Taste of Asia, which I had visited once before, a few weeks back. The sushi was excellent, but I can't boast enough about the service; as before, they were very attentive and anxious to see that we left more than satisfied. We did. The evening's last panel...with apologies to all involved...was the only low point of the weekend for me. The subject: "The Messiest Way to Kill a Zombie." And that's what it was...for an hour. The panelists and audience were certainly spirited, but I can't really see devoting a few minutes to the topic, much less an entire hour-long panel. To each his own, of course. I compensated with bourbon. My final con activity was a booksigning this morning, which went quite well; I sold and signed enough books to more than make the entire weekend worthwhile—even the zombie panel. Brugger and I hit Ham's for lunch...my traditional bison burger...and then off we went, her to an open house and me on a couple of long hikes after some caches in Jamestown. My favorite of the bunch had me out on a tree half-submerged in the lake. 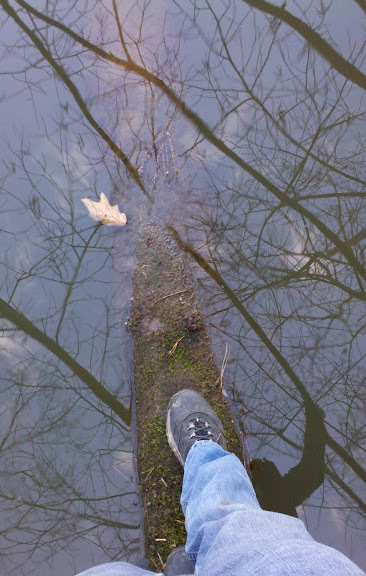 Much to my relief, I managed to sign the log and return to the lake bank without falling in. Brugger and I ended the evening by watching Angel Heart, which I hadn't seen in its entirety since its initial theatrical release in '87. It held up very well; I do quite like it, despite its almost excruciatingly slow pace. Trevor Jones's magnificent musical score really helps make that movie. I look like this . . . because this is where my feets are.